The mission of the Friends of the Cape Girardeau Foundation is to assist the Cape Girardeau Public Library by promoting its mission of information gathering experiences through social interaction, programming, technology, and the written word. The Friends will develop and encourage community involvement through fundraising, outreach, and volunteer services. Friends membership entitles you to a private showing during the first hour of the Annual Book Sales, advance notice and reservations for special library events and a quarterly newsletter. Each level also includes “Friends Bucks” which may be used at book sales and to purchase a Friends book bag. Also beginning at the $50 level a book will be added to the library’s collection. A one-inch “Book of Distinction” spine will be added to the donor bookcase for each member who donates $500 or more. If you are interested in membership, you may call the Cape Girardeau Public Library for more information (573-334-5279) or copy off the form provided and return it to the library. Donations to the Friends are tax deductible. The Friends of the Cape Girardeau Public Library Foundation is an organization of people interested in libraries. They sponsor activities which focus positive public attention on the library; encourage the use of the library’s materials and services; encourage gifts, endowments, and bequests to the library; and lend support developing library services and facilities for the community. To raise funds to support and enhance library services. 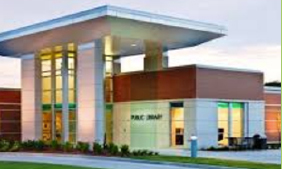 To act as trustee for the receipt, management, investment, disbursement and/or disposal of monies, goods or other effects received by the Friends by way of gift or otherwise for the general or specific use or benefit of the Cape Girardeau Public Library. To raise the public awareness of the library’s activities and services by uplifting those services in order for the community to appreciate the value of the library and its contributions so it will be the community’s first choice for social interaction and information gathering. To provide volunteer services within the library for public and staff support. a gift for the Foundation’s general fund which annually helps the library purchase items and programs outside of the operating budget. Concierge volunteers are members of the Friends Foundation who donate 2 hour blocks of time to sit at the Welcome desk in the lobby. The volunteers welcome library visitors, answer directional questions and help with the copy and fax machines in the lobby. With questions, contact Library Director Katie Hill at 334-5279, ext. 111 or Library Administrative Assistant Linda Bailiff at ext 112 for more information.